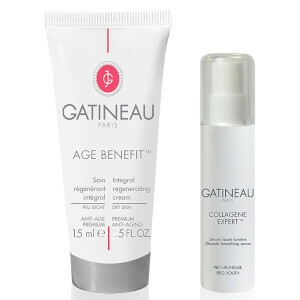 Discover the essential holiday skincare kit with the Gatineau Cleansing Travel Duo. Bringing together an ultra-nourishing cleanser and toner enriched with gentle Silk Extracts, the gift set contains everything you’ll need to comfort and care for sensitive skin. Take care of your skin with a comforting makeup remover suitable even for the most sensitive skin types. Enriched with a nourishing blend of Silk and Cotton Extracts and Sweet Almond Oil, the cleansing milk melts in effortlessly to sweep away any dirt, impurities and product build-up whilst replenishing vital moisture. The gentle formula works to improve elasticity and support the skin’s natural functions, helping to prepare the complexion for further skincare products. After use, the skin will be calm, comfortable and thoroughly refreshed. Envelop your skin in nourishment with an alcohol-free formula suitable for sensitive skin. Effortlessly melting away impurities and toxins whilst maintaining the natural pH and moisture levels, the makeup remover uses a blend of Cotton and Silk Extracts to soothe any irritation and discomfort. Enriched with Sweet Almond Oil to soften and smooth the skin texture, the cleanser helps to improve elasticity and refine the appearance of pores for a complexion that feels comfortable and looks super-healthy. Suitable for all skin types, especially sensitive. Use morning and evening. Simply massage the cleanser into dry skin with light, circular motions before rinsing off with warm water. Then pour the toner onto two cotton wool pads, lightly sweep over your face and neck and then pat skin dry.